Anyone who loves them. Parents. Siblings. Grandparents. Teachers. Small Group leaders. Pastors. Family Friends. The more, the better. Our students are very relational. They love when people they admire encourage and open up to them. Personalized Bible are the perfect way to give them a Bible they'll want to read. 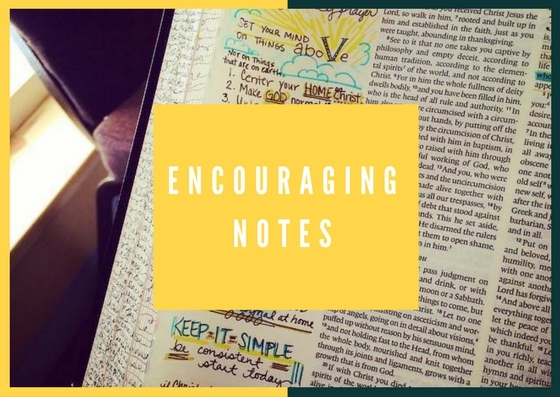 Find an encouraging Bible verse and write an encouraging note in the margin. Tell your graduate how much you love them. Brag on their hard work. Remind them of something wonderful they've accomplished. Tell them a story of when they were little. Underline YOUR favorite verses and write what it means to you. Be sure to sign your name! What verses have changed your life? Why? Be personal. What do you hope your graduate will learn in the next chapter of life? Underline a verse that could guide them in the next chapter.